Manufacturing & Trading of Polyurethanes Products. 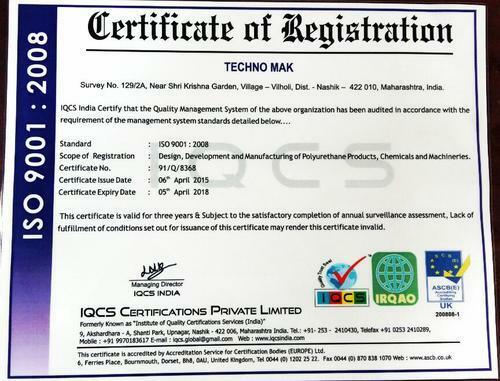 We, “Technomak” are counted among the prominent Manufacturing, Supplying and Distributing Polyurethane Chemicals, Mould Release Agent, Rigid polyurethane foam sheet, Rigid polyurethane foam slab, Polyurethane sandwich panel, Cold storage PU panel, PU pipe section, Polyurethane pipe section, Cold insulation material, Hydraulic Power Pack, Polyurethane Foaming Machines, PU foaming machine, High Pressure PU foaming machine, Low pressure PU foaming machine, cold storage sliding door, rigid polyurethane foam sheet, rigid polyurethane foam slab, P.U. dispensing machine, Automobile seats , Polyurethane foam, Packaging material,Slab stock foam, P.U. coating, Clean room and Molded Polyurethane Articles. We are Importer of Pumps, Moulds and other raw material & Service Provider offering Cold Room Services. These products are manufactured using high grade raw material, obtained from the certified vendors of the market. On the other hand, our Polyurethane Chemicals are highly acclaimed for their custom made formulations. These products find their application in the wide spread polyurethane industrial segment. We are known for maintaining high and consistent quality standards in our range. This stature is attained with the help of our sound quality testing laboratory, wherein we have installed requisite instruments. We have employed experienced quality auditors in this laboratory who perform stringent tests on every product using the available resources. These all activities make sure that our products meet the international quality standards. Our quality assured products enable us to maintain worthy links with the eminent clients. Further, considering the budgets of the patrons, we offer our range at reasonable prices. Our mentor, 'Mr. Vineesh Gopalan Mekoth' is a man with practical approach, who helps us in overcoming each business hurdle. His excellent vision and management skills have enabled us in overcoming various risks. We are a well established organisation engaged in manufacturing and supplying a broad array of Polyurethanes Chemicals, Polyurethane Foaming Machines, Mould Release Agents, Rigid polyurethane foam sheet, Rigid polyurethane foam slab, Polyurethane sandwich panel, Cold storage PU panel, PU pipe section, Polyurethane pipe section, Cold insulation material, Molded Polyurethane Articles etc. These products are manufactured in respect with the predefined industrial standards, by using supreme quality raw material and sophisticated technologies. Further, these products are widely demanded in numerous industries such as engineering, electronic and mechanical. Supported by a competent team of professionals, we are able to meet various targets, on-time. Our professionals possess years of experience in varied domains; hence, carry out different activities in a streamlined manner. Further, these experts judiciously utilize the available resources, which results in high productivity rate. For maintaining synchronization between the different departments, these experts work in close coordination with each other. With the expertise and dedication of our team, we have been able to able to earn a remarkable goodwill in the industry. Enriched by rich experience, we have emerged as the pioneer organisation engaged in manufacturing and supplying Polyurethanes Chemicals & Foaming Machines, Mould Release Agent, Molded Articles, etc . Our diligent team put forth its best and well coordinated efforts for ensuring high growth rates of the organisation. With their dedication and loyalty, we have been able to create a remarkable position in the market.